Van Buren's political views came directly from Jeffersonian Republicanism. Like Thomas Jefferson, he believed in States' Rights and opposed a strong federal government. During the early years of his career in New York, Van Buren controlled the so-called Albany Regency, a political machine that was very influential in state politics. Later, in the 1820s, he joined forces with Andrew Jackson and helped to forge the political alliances that would lead to the formation of the Democratic Party. 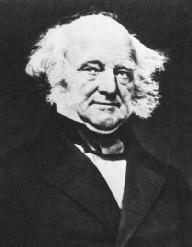 As in state politics, Van Buren enjoyed steady success at the national level. He won election to the U.S. Senate in 1821 and retained his senatorial seat until 1828 when he became governor of New York. He resigned the office a mere twelve weeks later, however, to become secretary of state under President Jackson. His support of Jackson through the president's turbulent first administration paid off: in 1832 Jackson chose Van Buren as his vice presidential running mate over the incumbent john c. calhoun, and the two were elected. Leonard, Gerald. 2001. "Party as a 'Political Safeguard of Federalism': Martin Van Buren and the Constitutional Theory of Party Politics. Rutgers Law Review 54 (fall). Mushkat, Jerome, and Joseph G. Rayback. 1997. Martin Van Buren: Law, Politics, and the Shaping of Republican Ideology. DeKalb: Northern Illinois Univ. Press. Silbey, Joel H. 2002. Martin Van Buren and the Emergence of American Popular Politics. Lanham, Md. : Rowman & Littlefield.